This recipe was created by Katie Myers, one of the admission representatives at The International Culinary Center, for the Gulf Coast fund-raiser. She also happens to be an alum of the pastry program at The FCI. 1. Place ice and water in a large bowl; set aside. 2. Melt the butter in a large saucepan set over medium-high heat. Add the cream, milk, and 1/2 cup of the sugar, and bring to a boil. 3. Meanwhile, whisk the egg yolks and the remaining 1/2 cup sugar in a mixing bowl. Whisking constantly, gradually add a few ladles of the hot cream mixture to the yolks. 4. Whisking constantly, add the warmed egg mixture to the remaining cream mixture in the saucepan. Reduce the heat to low, and cook, stirring constantly with a wooden spoon, until custard coats the back of the spoon and holds a line when a finger is run across the spoon (custard should read about 170°F on a instant-read thermometer). 5. Remove custard from the heat, and pass through a fine-mesh strainer into a clean bowl. Place bowl in ice-water bath, and cool custard completely. 6. Whisk the bourbon and salt into the custard. Place ice cream base into an airtight container. Refrigerate 2 hours. 7. 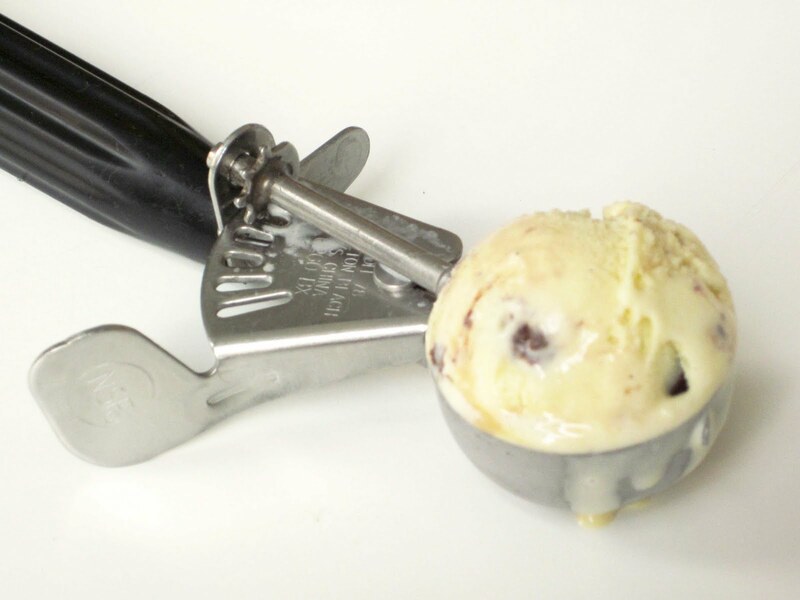 Place custard in the bowl of an ice cream maker, and process according to manufacturer’s instructions. 8. Place ice cream in a large container, and quickly stir in Candied Pecans and Ganache Tar Balls. Place in an airtight container, cover, and freeze overnight before serving. 1. Melt the butter in a shallow saucepan. Add the sugar gradually, stirring as needed to keep it from cooking unevenly and waiting to add more sugar until previous sugar has mostly melted, to make a dry caramel. Continue cooking until the caramel is the color of light maple syrup (make sure the caramel is not too dark as it will continue to cook off heat). 2. Remove from the heat, and stir in the pecans and salt. 3. Pour onto a baking sheet lined with a Silpat baking mat, and quickly separate the nuts from one another with a spoon. Let cool completely. 4. Roughly chop the cooked nuts, and place in an airtight container. Store in a cool, dry place until ready to use. 1. Place the chocolate and butter in a large bowl, and set aside. 2. Bring the cream to a boil in a small saucepan set over medium-high heat; pour over reserved chocolate and butter. Let stand 1 minute before whisking to combine. 3. Let ganache stand at room temperature until it reaches a pipeable consistency. Place the ganache in a piping bag fit with a small round tip, and pipe dime-sized balls onto a baking sheet lined with parchment paper. Freeze until ready to use.